Win a trip for 2 to Lego Land Malaysia at Stardibs.com! Are you a showbiz afficionado who likes to collect pre-loved celebrity items or simply looking for great deals? Then here's a chance for you to get exactly that! Read on to know the good news! Good news to bargain hunters, discount shoppers and fans of local showbiz stars alike! If you’ve always loved a good deal, are always on the look-out for the lowest prices of gadgets, clothes, appliances, jewelries, accessories and other items, and would love to be somehow closer to your favorite stars, then we have found a new site for you that you will surely enjoy! Introducing Stardibs.com! Stardibs is a website that was built exactly a year ago specifically to auction off the pre-loved items of celebrities in the local showbiz industry. The site uses a “reverse auction method”, which means that instead of the price increasing for each new bid to an item –as practiced in regular bidding at Stardibs, the price actually decreases with each new bid which allows the winning bidder to walk away with the item at a very low price! By building a site on the internet to auction celebrity items, Stardibs doesn’t only allow the fans, collectors and admirers of the local stars to be closer to their idols, but it also gives chance to online shoppers to purchase brand new gadgets and other exciting stuffs for a very low price! Stardibs calls auction participants, Dibbers. They may browse the items according to categories which include Appliances, Cars, Fashion and Beauty, Food and Beverages, Gadgets, Gift Cards, Hotels, Kitchen Equipment, Sports, and Travel and Vacation. Meanwhile, for fans who want to buy their favorite celebrity items, they may also opt to browse the items on the site according to celebrity names. For payment options, Dibbers can pay through PayPal, Ubiz/Unionbank or Pasabayad, Or If they don’t have account with these payment gateways – They can still pay by depositing it in Unionbank/BPI. Winning Dibbers may claim their items at G/F Unit 14, East of Galleria, Topaz Road, Brgy. San Antonio, Ortigas Center, Pasig City. For those who are worried that signing up might be complicated, you can be assured that registration is hassle-free, as all you need to do is go here : http://www.stardibs.com/registration.phpand fill up 5 simple fields, click submit and voila! You can start Dibbing and shopping! And because Stardibs has just reached its first year anniversary, it currently offers a special Anniversary Promo to all Dibbers! 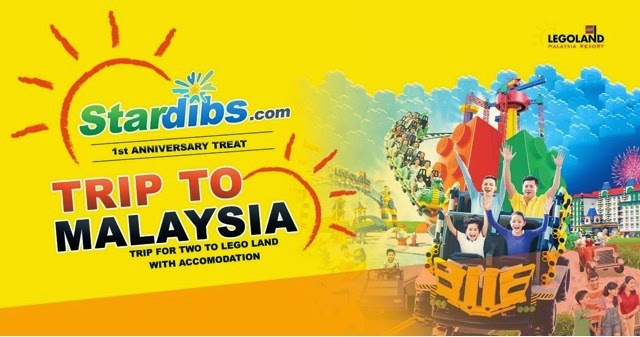 Starting on May 6 to May 20,2015, Stardibs.com will be having a raffle promo that will give all members who signs up at the site a chance to win a travel package for two to Malaysia, complete with travel accommodations and free tickets to Lego Land, Malaysia! How it works is that each new member who registers on the site and also like their facebook page will be given a raffle entry, and then after that, all you need to do is sit back, relax and wait for the announcement of the winner for the promo that will happen on May 20, 2015 in the 7:00 PM in the evening. Winner(s) will be contacted via email and the phone numbers they’ve provided during registration. So what are you waiting for? Sign up now at Stardibs.com and start dibbing for you to get a chance to own brand new gadgets and own your favorite celebrity pre-loved Items, but you may also bag the chance to win a free trip to Malaysia with friend!